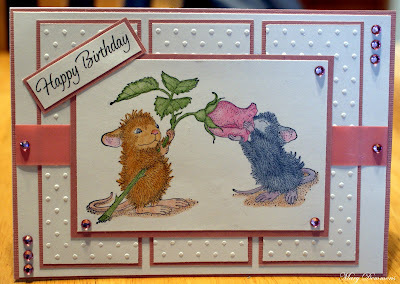 I made this birthday card using the adorable stamp from House Mouse called Everything Is Coming Up Roses. I colored the image using crayola colored pencils. The sketch that I used is from this week's challenge at Card Makin Mamas. The base of my card is white backed in rose. For the three strips behind the image I used white cardstock that I embossed using a cuttlebug embossing folder (dots) and then backed each in rose. The embossing is for the challenges at House Mouse & Friends Monday Challenge and Inky Impressions. I used a piece of rose paper ribbon across the three strips behind the image. I backed the image and sentiment in rose and added some pink rhinestones to finish off the card. Stunning! Beautiful sketch to work with and love what you did with it. The pretty pastel colors and that sweet image are perfect. thanks for joining us at the House Mouse and Friends Monday Challenge. Super cute project! Thanks for playing along with us at HM&F Challenge this week! this is a great card with lovely use of embossing to showcase your sweet image! Thanks for sharing with us at Houae Mouse and Friends Monday Challenge! Gorgeous card Mary, such lovely colours, fantastic embossing and your image is so adorable. This is just gorgeous! Lovin the bling! Gorgeous sweet image great colouring fab take on the embossing chall...thanks for sharing with us at HM & friends Monday chall. Very sweet! I love the 3 embossed panels!! Very pretty -- great layout! Thanks for joining us at Kaboodle Doodles! Amazing card. Thank you so much for joining us at House Mouse & Friends Monday Challenge. Beautiful colours for spring Mary, a really lovely image and card. Oh Mary, you've rocked this Challenge. I am loving this card. Just perfect. Thanks for joining us at Inky Impressions. Hope to see you next challenge. Thanks for joining us at Penny's Paper Crafty this time, hope to see you again next time. Gorgeous card! Love the embossing and all the corner baubles! Great take on our sketch! this is gorgeous. I love all the white. Thanks for getting sketchy with us Mamas.